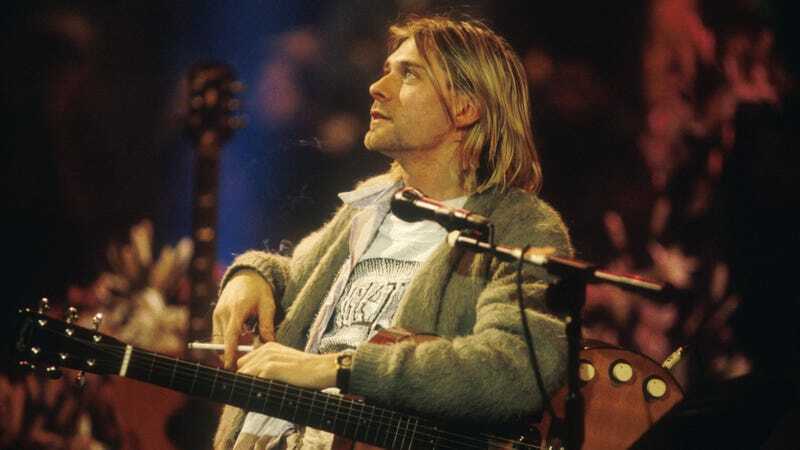 We’ve been reporting for years now on the bizarre custody battle being waged over Kurt Cobain’s 1959 Martin D-18E, the guitar the Nirvana frontman played during his now legendary 1993 taping of MTV Unplugged. The core of the dispute comes down to a disagreement between Cobain’s daughter, Frances Bean Cobain, and her now ex-husband, Isaiah Silva, who says she gifted him the guitar as a present in 2014. Cobain has frequently disagreed, requesting the family heirloom back. And then her mother, Courtney Love, got involved, and you can probably guess where it went from there. Or maybe not; as reported by Billboard, Silva has just lodged a new lawsuit against Love and her business manager, Sam Lutfi (a former manager of Britney Spears during one of her less healthy periods, and a noted fixture in the less savory stories of the musical world), one that’s weird even by “stories about Courtney Love” standards. The Eeries singer has accused Love, Lutfi, and—bizarrely—13 Reasons Why star Ross Butler of conspiring to kidnap and maybe even kill him in an effort to get him to give back the guitar. Specifically, he’s suing Love, Lutfi, Butler, and others over an incident we reported on back in 2016, which is now even stranger in hindsight: Silva says Love, Lutfi, Butler, and another man supposedly hacked into his iMessage account in an attempt to send fake suicide notes to a number of his friends, in the interest of then killing him, making it look like a suicide, and taking back the guitar. After that, he says, the harassment saw a sharp uptick, culminating in Lutfi, Butler, and Lutfi’s chauffeur allegedly breaking into his home one night, threatening him with violence and sexual assault, and attempting to kidnap him to an unknown location. When police intervened, Silva says, Lutfi threatened his family (including his daughter), in order to get him to go along with their story. This is, obviously, a fairly bonkers set of actions to take in an effort to secure a guitar, even a famous one that’s been on TV. Love and Lutfi have denied all the allegations today, as well as Silva’s repeated assertions that Lutfi and Butler supplied his ex-wive with the drugs that helped contribute to the end of their marriage. And in case this whole scenario wasn’t already sufficiently fucked up and personal, Silva’s lawsuit apparently also goes on—“several times,” in fact—to suggest that Love’s alleged tactics line up with the circumstances of Kurt Cobain’s death, even quoting Cobain’s mother as saying she was “keenly aware of the disturbing correlations between his circumstances and those of O’Connor’s late son.” Jesus. Silva and Cobain officially divorced last year, with an undisclosed settlement that apparently included Silva keeping the guitar, while Cobain received most of the rest of the couple’s property. Silva filed a police report about the alleged harassment campaign against him in 2016; it’s not clear why he’s decided to lodge a lawsuit against Love and Lutfi now.